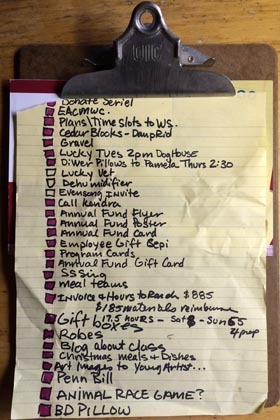 Making Order Out of Chaos: and checking it off my list! I know I am not the only one immersed in merry chaos. This time of year is both overwhelming and wonderful. Parties, visitors, excursions, gift making and taking, travel and arrivals, menus and prepping all in the midst of regular work and life filled with the usual laundry and groceries and dog walks. Now as many of you know I am a list maker. I love my list and my clipboard; I love to make squares and write my tasks black marker then with my designated sharpie pen mark each square in. I feel most chaotic when my list is long and I am unable to fill in any blocks, and it drives me nuts when I complete a task that isn’t on my list while the list remains unfinished, what to do in this situation? Well as anyone of my personality type knows you write the thing just completed on the list then fill in the square, of course! I’m heading our to hang out with family at my folks for a week on Monday so my list is long but you can see my satisfaction with this one there are only 3 squares unmarked! I had to start a new list but never mind this one was almost fully complete – a minor Christmas miracle I’d say. With this order to chaos frame of mind you will see why I found such satisfaction with these new art pieces. My process was fun; first create chaos then find order in it. 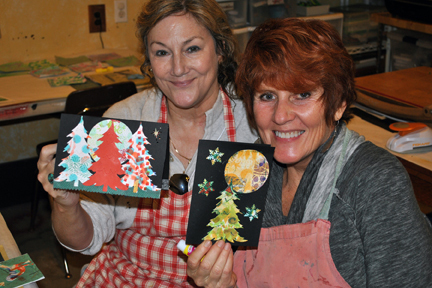 Early in December I taught a surface design and collage class here at The Bishop’s Ranch (see December 9th post). I made a few samples for the class and demos during the class. 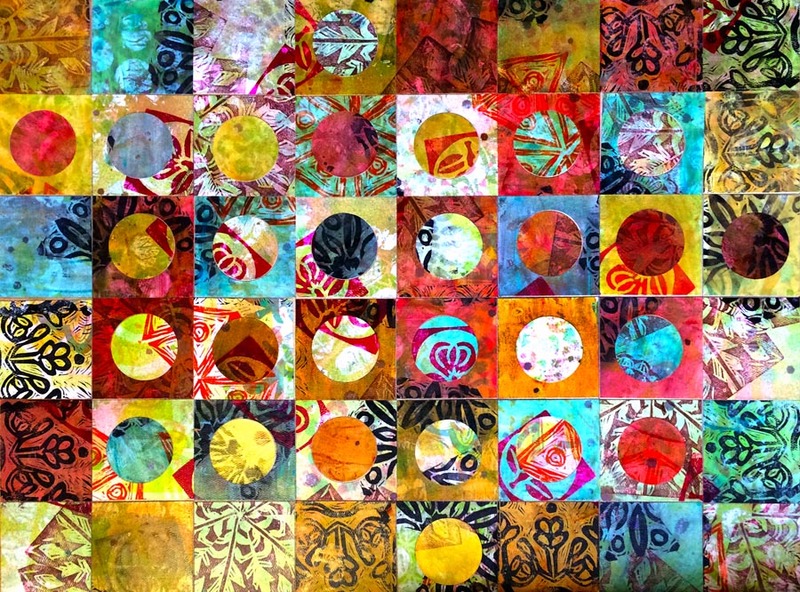 I used stencils and sprayed watercolors, the carved stamps and printed, and printed bubble wrap and stenciled some more and created this lovely layered chaos. I didn’t plan or ponder much just kept adding until time was up (lunch). Such fun in just letting the surface evolve no preconceived notions no real agenda just adding and layering. So after the weekend workshop I had these lovely large sheets of design paper. What to do? Well I cut and colored and arranged with a quilters eye to create the piece above. I love the order and the chaos, the pattern and then jumbling the pattern. It felt very satisfying creating this work. It had been months since I created art for no reason at all – not a commission, or sample for a workshop, or graphic design for a client – just art for no reason at all – it felt good. 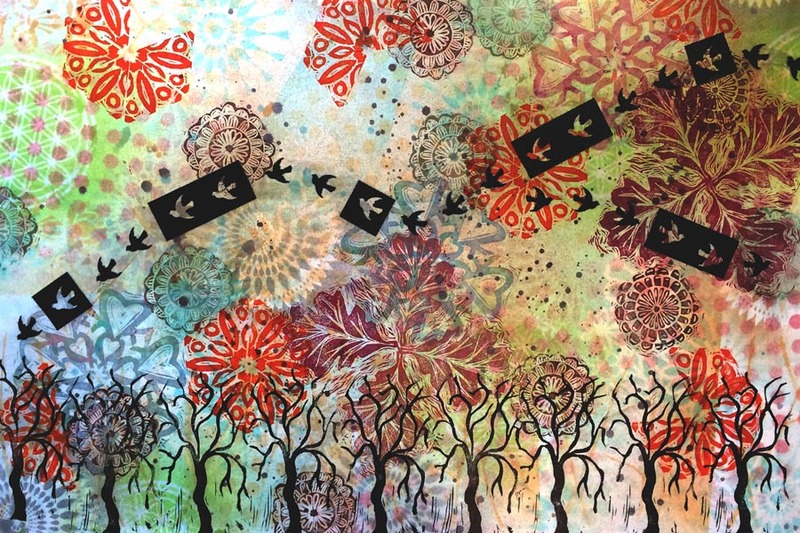 The piece below is also using one of these sheets of paper uncut but the bare black trees and the flying birds bring order to the lovely chaos below. I love these pieces. It reminds me I need to break away from my list more often and make a jubilant jumble and merry mess more often then set my orderly self to arranging this beautiful chaos into art that embraces both the unruly and the orderly. 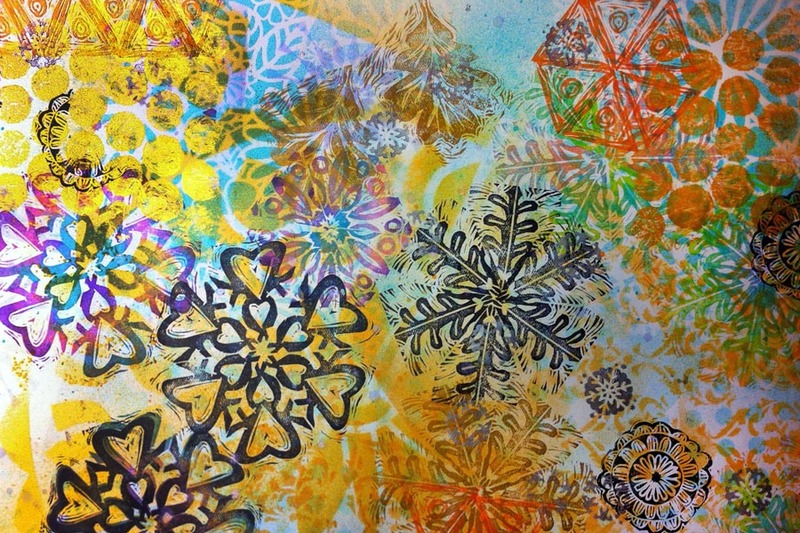 Surface design sample for December workshop. a 24″x36″ piece made from also from workshop paper. Here’s hoping your holidays are filled with merry, messy, lovely chaos. See you in the New Year! The rain took a break this weekend here at The Bishop’s Ranch but a group of creative souls and I hunkered down inside the Art Center to experiment and create for 2 fabulous days of color and collage. 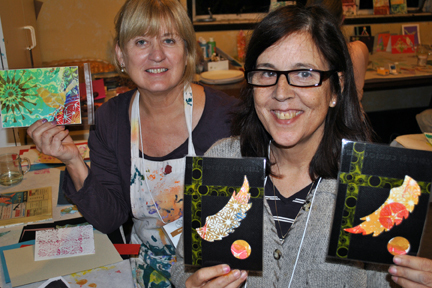 On Saturday everyone created a large sheet of art paper experimenting with stencils and carved stamps. Spraying, stamping, spritzing, making and marking. In the afternoon we cut up our creations to make little collages to use as cards, small art pieces, bookmarks and more. I stopped at 4pm but this intrepid band of creators, spurred on by a glass of wine stayed in the art center until dinner and some stayed into the wee hours of the night and others came early in the morning to continue making that’s how energized they were to create! Sunday the fun continued with more collage and making of paper lanterns. I learned a lot from my students and they were all thrilled with their weekend. I look forward to leading this retreat again next year – the first weekend in December – mark your calendars. 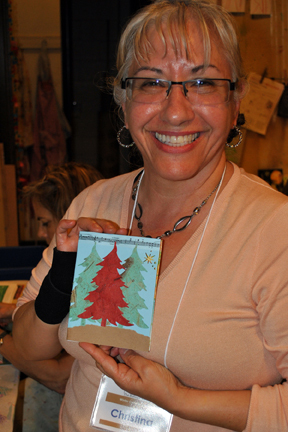 Christina all smiles – loving her creative weekend experience! My next creative retreat offering is Creativity Bound – February 21, 2015. For this creative retreat I team up with friend and poet Laurie Glover. 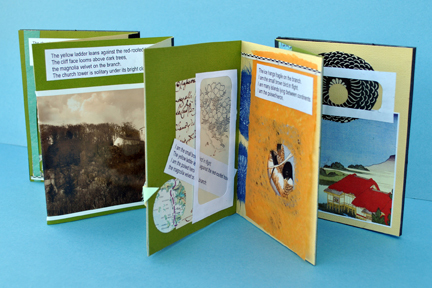 Laurie will lead us through the process of writing a poem in a very non-threatening process guaranteed for success, and I’ll lead the making of the collage accordion book. We came up with a process where the collage elements inform the poem and the poem informs the collage. 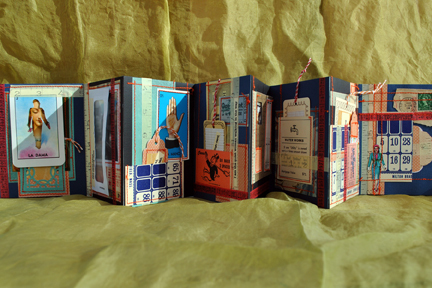 The day will unfold just like the accordion book. All the instruction happens Saturday but we are offering Sunday as an open studio day with all the materials out for those of you who want to extend and continue your exploration. I hope you’ll join me. Creativity Bound workshop signup. Laurie’s book made on our creative play date to prepare for the CREATIVITY BOUND workshop in February. My book made on our creative play date to prepare for the CREATIVITY BOUND workshop in February.